Jersey Shore Boca goalkeeper and Providence College freshman Chris Konopka completed his week-long competition today at the Home Depot Center in Carson, CA earning a 1-1 tie for his U19 US Soccer Region I team against the United States U-20 Men’s National Team. CARSON, CA (January 5, 2004) – Jersey Shore Boca goalkeeper and Providence College freshman Chris Konopka completed his week-long competition today at the Home Depot Center earning a 1-1 tie for his U19 US Soccer Region I team against the United States U-20 Men’s National Team. Konopka and his U-19 Region I teammates held the US U-20s, which included MLS players Freddy Adu (DC United), Arturo Alvarez (San Jose Earthquakes) and Guillermo Gonzalez (LA Galaxy), at bay for most of the 90 minute match. The US U-20s scored in the 20th minute of the first half on a spectacular half-volley into the side of the goal by Jamie Watson (University of North Carolina) assisted by Adu. The Region I U-19s evened the score in the 25th minute on a low, near post shot that got by Phil Marfuggi (Clemson University), the US U-20 keeper. Throughout the second half, both sides had a few opportunities which they could not capitalize on. The US U-20 National Team finished the event with an overall record of 2-0-1 with their only non-winning match coming at the hands of Konopka and the Region I U-19s. This was Konopka’s second full match of the camp. On Saturday, the US Soccer Region I U-19s lost 1-0 to their counterparts from Region II in a very physical match. The Region II U-19s scored off a free kick with less than 30 seconds remaining in the match. The purpose of this national soccer event is to help further identify up and coming top elite young players for the Under-20 Men’s US National Team player pool for 2004 and 2005. The event was attended by US Soccer Federation staff and coaches including Thomas Rongen, the head coach of the Under-20 United States Men’s National Team as well as other professional coaches and scouts. Konopka now awaits word from the US Soccer Federation if his performance at this event warrants a second look at the next US U-20 National Team camp to be held in Florida in February. The Toms River resident was one of only 16 players selected to the Region I team from ten northeast states located between Maine and Virginia. He was also only one of two players selected to the team from New Jersey. Konopka has just completed his first collegiate soccer season under Coach Chaka Daley at Providence College, a member of the Big East Conference. He played in 5 games for the Friars while starting two. Konopka posted a 1.63 goals against average and 72.2% save percentage for the season. The Home Depot Center is a 125-acre development in Carson, California featuring state-of-the-art stadiums and facilities for soccer, tennis, track and field, cycling, volleyball, baseball, softball, basketball and other sports. Designated as an Official U.S. Olympic Training Site, the Home Depot Center is the nation’s most complete training facility for Olympic, amateur and professional athletes. Created around a 27,000-seat soccer stadium, the complex is located on the campus of California State University Dominguez Hills. The Home Depot Center is the home of the 2002 MLS Cup Champion Los Angeles Galaxy and is the U.S. Soccer Federation’s National Team Training Headquarters. He was honored as an Adidas/NSCAA Regional All-American as a senior. Konopka is also a two-year member of the US Region I Olympic Development Team and a long-time member of the Jersey Shore Boca soccer club. 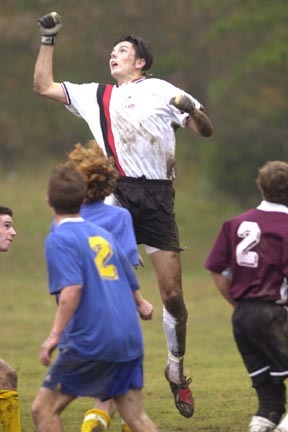 He was also a member of Boca’s 2003 Premiere Development League team and Boca’s Super Y-League teams in 2002 and 2001. Jersey Shore Boca has been a fixture in the soccer community since 1978 and is one of the most respected soccer clubs in New Jersey. The club celebrated its 25-year anniversary in 2003. The club will compete in the United Soccer Leagues elite Super Y-League for the fourth straight year in 2004.